『집대승상론』은 대승불교의 요체를 집대성해 놓은 논서이다. 각길상지(覺吉祥智)가 짓고, 시호(施護)가 한역하였다. 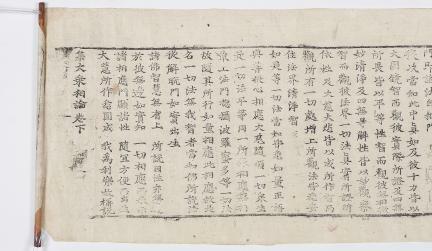 5온(蘊), 12처(處), 18계(界), 12연생(緣生), 10바라밀(波羅蜜), 10지(地), 18공(空), 37보리분(菩提分), 4성제(聖諦), 4정려(靜慮), 4무량심(無量心), 4무색정(無色定), 8해탈(解脫), 입관(入觀)차제(次第), 3해탈문(解脫門), 6신통(神通), 다라니문(陀羅尼門), 10역(力), 4무외(無畏), 4무애해(無礙解), 대자(大慈) 대비(大悲), 18불공법(不共法), 4성문과(聲聞果), 진여(眞如), 무상(無相), 법계(法界) 등을 차례로 설명하고 있다. 이 책은 전체적으로 먹색이 흐릿하다. 권의 끝에는 후대에 만든 것으로 보이는 권축이 있고, 이 축에 두루 마는데 편리하도록 종이를 연미형으로 잘라 놓았다. 이 자료와 재조본의 해당 권수와 대비한 결과, 이 논의 제3장(8행 제10자)에 있는 “請”자는 “淸”, 제5장(22행 제4자)의 “徧”자는 “遍”으로 바뀌어져 있고, 또한 “著”자는 “着”으로 모두 고쳐져 있는 점이 주목된다. 공개된 국내 전본으로는 현재까지 유일하고, 상태 또한 양호한 편이다. Mahayana Laksana Samuccaya Snama is a compendium of Mahayana metaphysics. 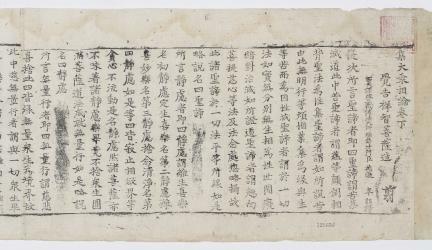 This text written by Buddhasrijnana was translated into Chinese by Shihu. 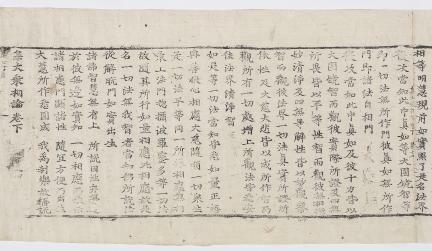 The various concepts fundamental to Mahayana Buddhism are explained, including the five skandhas, Twelve sense fields, eighteen realms, twelve nidanas, ten paramitas, ten terras, eighteen aspects of emptiness, thirty-seven bodhyanga, four noble truths, four viharas, four immeasurable minds, four states of formless concentration, eight kinds of meditation to free one from attachments, abhisamaya-krama, three gateways to emancipation, six super-knowledges, Dharani gate, ten powers of Buddha, four fearlessness, four unobstructed knowledge, great mercy, great compassion, eighteen unshared properties of the Buddha, four voice-hearer fruits, thusness, formlessness and the dharma realm. The quality of printing is rather mediocre with the ink being pale throughout. 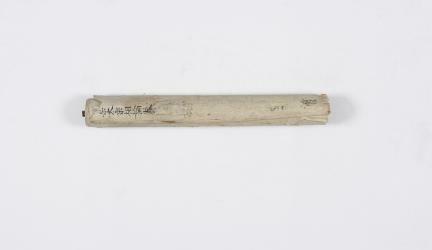 The volume has a rod at the end which appears to have been later added, and the sheet is cut along the edge, into the shape of a swallow tail, so that the sheet can be easily rolled into a scroll. 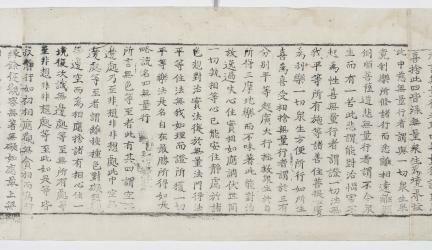 The comparison of this book with the one printed with the second Tripitaka Koreana blocks revealed that the character “請” in the third sheet (tenth character of the eighth line) is replaced in the latter, by the character “淸”, and the character “徧” in the fifth sheet (fourth character of the twenty-second line) by the character “遍”. Further, all “著”s are replaced by “着”s. 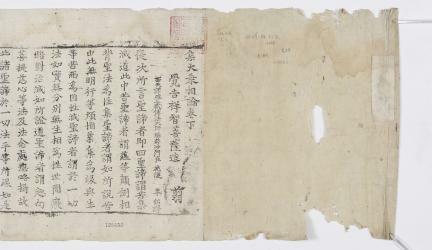 This well-preserved book is the only copy of this book that has been put on display for public viewing.